If you lose your shopping mood when there is too much hustle and bustle, you should try to visit the market during the week, although some stalls open only on weekends. From Friday till Sunday you need to expect big crowds. 1. 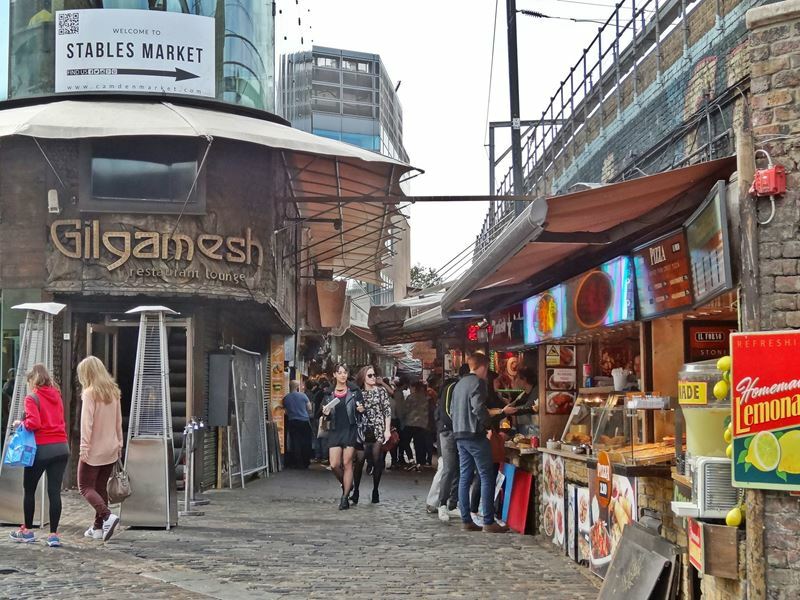 The Buck Street Market is located at the corner of Buck Street and Camden High street, not far from the underground station. About 200 stalls line up along narrow corridors at this outdoor market. There are mainly simple textiles such as T-Shirts, jeans, caps, costume jewelry and other cheap mass products. 2. 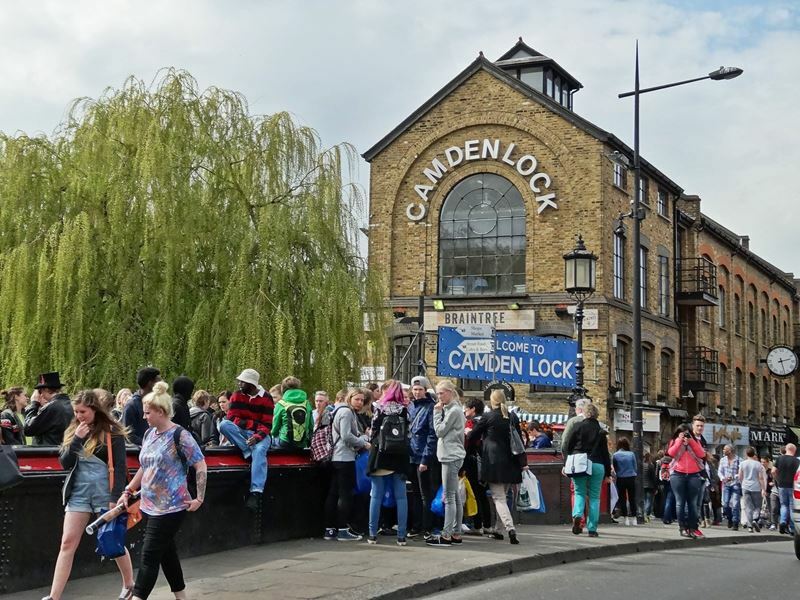 The Camden Lock Market can be found at the end of the Camden high street, just after the bridge over Regent's Canal. 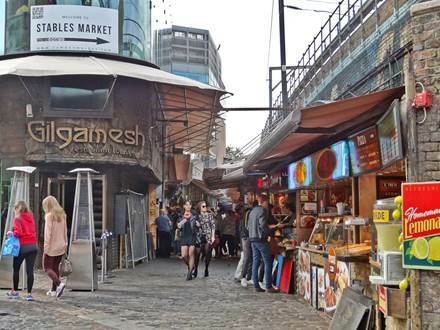 This market area is regularly used since 1975 and is therefore the origin of the Camden Markets. At this place you will find many stalls with high-quality craft items located in and around a building with 3 floors. Particularly noteworthy is also the wide range of food stalls with fragrant dishes from all over the world. This is Street Food of the finest kind. 3. The Stables Market is located along the Chalk Farm Road in an area where in early times there have been stables. The stalls and shops are usually covered and are located mainly in these stables or in the arches under a railway viaduct. At approx. 700 shops and stalls you can find among others alternative fashion, vintage clothing, furniture, antiques and Second-Hand items. 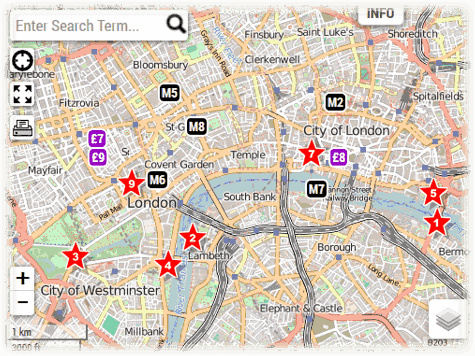 Which day is the best for your visit? Although the Camden Market is open 7 days a week you should consider carefully which day you choose for your visit. Friday, Saturday and Sunday are the days where all stalls and shops are usually open. If you like to experience the lively hustle and bustle among like-minded people, you should choose the weekend. 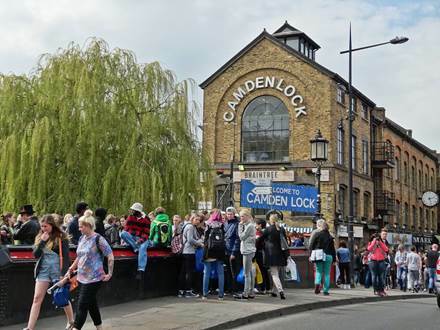 If you prefer the relaxed Camden Town atmosphere, you should start your visit in the late morning during the week. Only downside in that case is that some stalls open only on weekends. Which underground station should I get off? 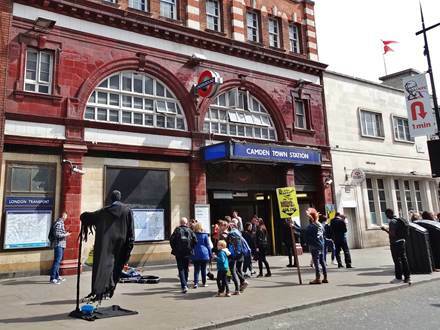 Both underground stations, Camden Town and Chalk Farm, are well suited for your arrival. If you are planning to have an extensive shopping day, you should get off at Camden Town station. 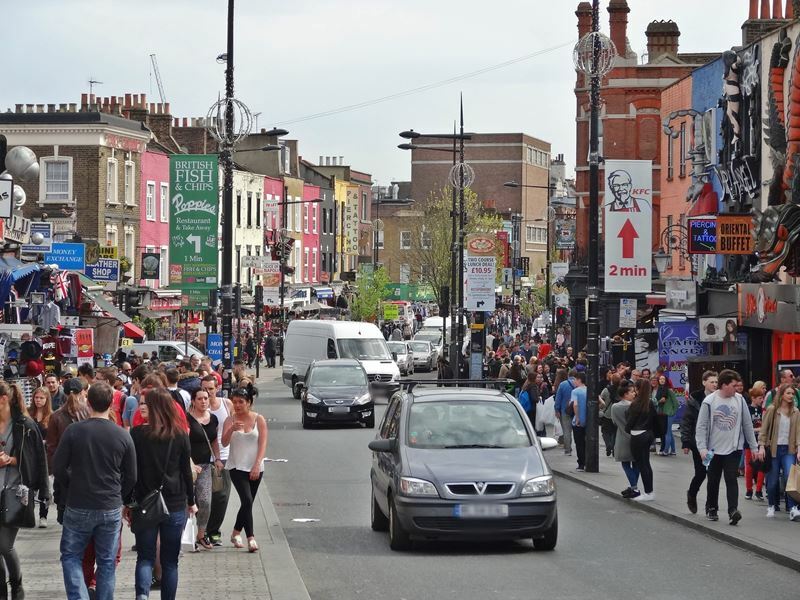 You arrive there directly into the shopping crowds and pass by at the different areas on your way to Chalk Farm station. 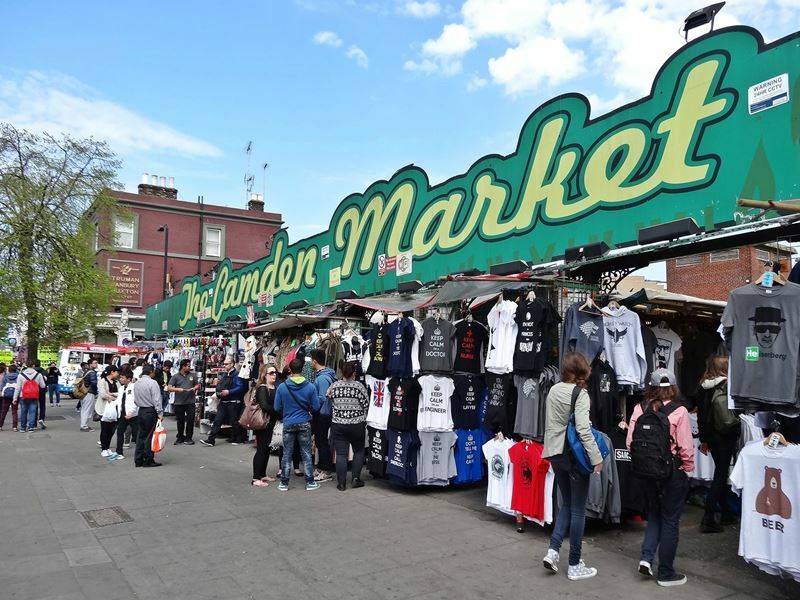 If you do not plan to spend too much time and if you are not interested in cheap mass products, you should get off at Chalk Farm station and visit only the Stables Market and in any case the Camden Lock Market. If you like to surprise your stomach with extraordinary dishes, you should schedule a break at one of the many food stalls. Usually you will not have any troubles to develop the necessary appetite as there are so many places with intense and exotic smells of the offered dishes.